Curry is one of the most popular dishes in Japan. It is commonly served in three main forms: curry rice, karē udon (thick noodles) and karē-pan (bread). Curry rice is most commonly referred to simply as 'curry'. Left: A serving of Japanese curry rice. A wide variety of vegetables and meats are used to make Japanese curry. The basic vegetables are onions, carrots, and potatoes. For the meat, beef, pork, chicken and sometimes duck are the most popular, in order of decreasing popularity. Curry was introduced to Japan during the Meiji era (1869 - 1913), at a time when India was under the administration of the British. The dish became popular and available for purchase in supermarkets and restaurants in the late 1960s. It has been adapted since its introduction to Japan, and is so widely consumed that it can be called a national dish. Curry sauce is served on top of cooked rice to make curry rice. Curry sauce is made by frying together curry powder, flour and oil, along with other ingredients, to make roux; the roux is then added to stewed meat and vegetables, and then simmered until thickened. In Japanese homes, curry sauce is most commonly made from instant curry roux, which is available in block and powder forms, and contains curry powder, flour, oils and various flavourings. Ease of preparation, and the wide variety and availability of instant curry mixes, has made curry rice very popular, as it is very easy to make compared to many other Japanese dishes. Pre-made curry is available in vacuum-sealed bags that can be reheated in boiling water. The main differences from other curries is that Japanese curry is thickened with a roux and is sweeter due to the addition of fruit such as apples. While slightly more time consuming than using a sauce mix, preparing it from scratch is a fairly simple process similar to making gravy. Japanese curry rice is made from rice, curry sauce, vegetables and meat. The process of making the curry starts with sautéeing chopped vegetables and meat in oil, margarine, or butter. Once the meat has been browned and the onions softened, water is added and brought to a boil. The ingredients are then simmered under low heat for about 20 minutes (as per instructions on roux boxes) or much longer if more tender meat is desired or if stewing meat is being used. Cooking time can be quartered by using a pressure cooker. Finally, the curry mix is added and stirred frequently for about five minutes to dissolve. The curry is then ready to be served. 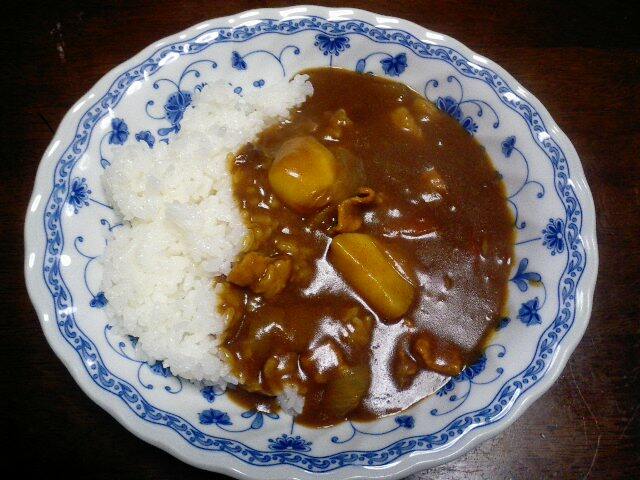 Japanese curry rice is served in anything from a flat plate to a soup bowl. The curry is poured over rice in any matter and amount. Japanese short grain rice, which is sticky and round, is preferred, rather than the medium grain variety used in Indian and Chinese dishes. It is usually eaten with a spoon, as opposed to chopsticks, because of the liquid nature of the curry, and is usually served garnished with vegetables pickled in vinegar.